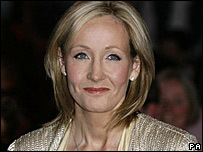 Harry Potter author JK Rowling has lost a High Court action seeking to ban the publication of a picture of her son. The photo showed Rowling pushing David, who was 20 months old at the time, in a buggy on a street in Edinburgh. The author complained that David's right to privacy had been infringed and sought to prevent future publication. The judge said the law did not provide celebrities with "a press-free zone for their children in respect of absolutely everything they choose to do". The Sunday Express magazine had printed the photograph alongside an article about Rowling's approach to motherhood. The writer sued Express Newspapers and the agency that supplied the photograph, Big Pictures (UK). The author - who filed the claim on behalf of her son under her married name Mrs Joanne Murray - sought damages and an injunction banning further publication of the photograph or any other picture taken of him without his consent. In a statement, Rowling said she and her husband Neil were "disappointed by the judgement, which seems to have misunderstood our claim". "Our aim has only been to protect our children from press intrusion during their childhood. "We see no legitimate reason why, as in this case, David, who was less than two years of age at the time, should have his photograph taken and then published in the press. "We take his, and that of his siblings, privacy and safety very seriously." The author added that she intended to appeal against the ruling. Express Newspapers settled the claim and the judge, Mr Justice Patten, struck out the remaining proceedings against the picture agency. Big Pictures was awarded £40,000 interim costs against the Murrays pending the outcome of the appeal and a final costs assessment. The judge has imposed a temporary ban on publication of the picture pending the appeal. "I have considerable sympathy for the claimant's parents and anyone else who wishes to shield their children from intrusive media attention," Mr Justice Patten said. But he added that "an area of routine activity which, when conducted in a public place, carries no guarantee of privacy".